I was born in Boulder, CO but moved away at a young age. I went back to visit in 2003 at the age of 29 and during my visit visited Manitou Springs. When I got there they were celebrating the annual Coffin races. 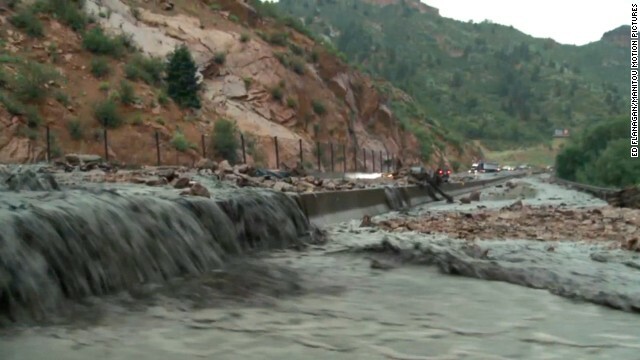 I came to find that in the 1800's a well known woman in the community was buried at the top of a mountain in Manitou Springs and during a torrential downpour and flooding such as the one in this article, her coffin was unearthed and came racing down the mountain. Hence the reason that every year they celebrate the event with the annual coffin races where everyone makes their own coffin to race down the mountain. Kind of dark but funny. I hope this wasn't the date for the races.